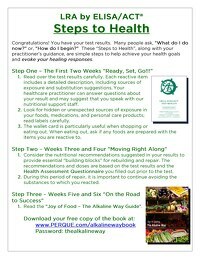 If the HAQ (Health Assessment Questionnaire) was submitted, the LRA results will also include a safe, effective, and personalized supplement plan with behavioral recommendations. A individualized rotation diet can also be included upon request. Consultation with Certified Clinical Nutritionist (CCN) is available. To learn more about Well Guard we invite you to sign up for the Well Guard Training eLearning series. Each week you will receive an email detailing 1 of the 5 key elements of the Well Guard training. You will even have an opportunity to become a certified Well Guard Practitioner by successfully completing each of the knowledge assessments. Certified Well Guard Practitioners receive a certificate, access to special program pricing, and exclusive consultations with integrative medicine thought leader Russell Jaffe, MD, Ph.D., CCN. Learn how Well Guard can help you help your patients and your practice. Sign up now. 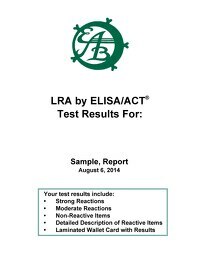 EAB's Client Services team and clinical staff are available to assist you with questions regarding test results and implementation of the LRA treatment plan. Call 1.800.553.5472 or email ClientServices@ELISAACT.com with any questions.